Park near the Hawsen Burn in the Harthope Valley (NT 953225). Follow the signed path to Housey Crags, across a small wooden footbridge and through the trees. Cross the step stile and climb steeply up a clear, green path to the left of and then behind the crags. Continue to follow the path across Long Crags and then step over the stile. The path now heads across the cotton grass rich moorland of Kelpie Strand towards the `cone` of Hedgehope Hill. On reaching the 450 metre contour, the path begins to swing towards the south-west as the steeper climbing gets underway. 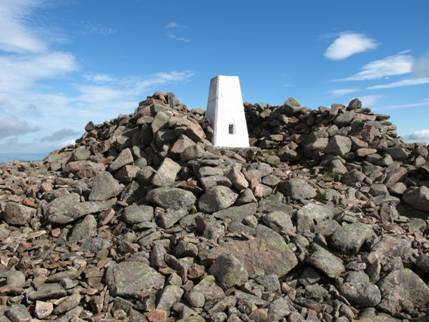 The gradient sharpens, as you gain over 260 metres in height in just over half a mile of walking, before finally reaching the cairn topped summit of Hedgehope Hill.